A set of two classic Castlevania games, including the cult classic Symphony of the Night and Rondo of Blood. The package includes original versions of both productions, although with a few additional options. 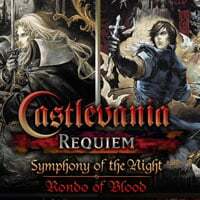 Castlevania Requiem: Symphony of the Night and Rondo of Blood is a collective edition of two cult Castlevania games: Castlevania: Rondo of Blood from 1994 and its direct continuation Castlevania: Symphony of the Night. The package was released by Konami exclusively on PlayStation 4. History of the games included in the Castlevania Requiem focuses on the Belmont clan, whose members have an eternal battle with Dracula. In the Rondo of Blood we play Richter Belmont and set out to save his beloved vampire, abducted to the castle. In Symphony of the Night the first violin is played by Alucard, Dracula's son, a dhampir (half-man, half-vampire), who goes to his father's estate in connection with mysterious events. The gameplay in both titles of Castlevania Requiem remained unchanged. Players receive two classic metroidvania games, in which we travel through successive locations and fight enemies, including powerful bosses. In the course of the game we gain access to further abilities, not only helpful in combat, but also giving access to new locations. Symphony of the Night adds RPG elements to the above diagram. For each defeated enemy, the hero gains experience points, and after reaching a certain number of them, he is promoted to the next levels, which increases his statistics: attack strength, defense, happiness and intelligence. The latter is responsible for magical abilities, activated by means of specific button combinations. An important difference between the two games are their main heroes, who use different fighting styles. Richter wields a chain called the Vampire Assassin and uses six side weapons such as holy water and an axe. Alucard also has access to the latter, but it can also turn into a fog or bat and use the help of familiars. Moreover, in Symphony of the Night you can find additional weapons (swords, shields, knives, whips, etc.) and other useful items with various properties. This allows players to deal with challenges in different ways. The games included in Castlevania Requiem are original versions from the 1990s, emulated on PlayStation 4. As a result, both titles use the same two-dimensional visual setting (with occasional 3D objects in the Symphony of the Night), as in the original editions. However, developers implemented image scaling to 4K resolution as well as additional rendering options and improved background quality. The atmospheric music remained unchanged, combining gothic rock, metal, techno and classical music into a single whole. In the case of Symphony of the Night Konami added support for the Dual Shock 4 controller functions: loudspeaker, vibration system and analog knob.